Review: I loved the first book in this series and I admit I was a little worried this would be a disappointment. 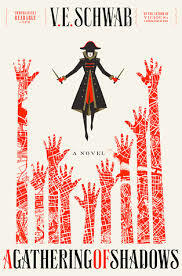 I shouldn't have doubted the amazingness knows as VE Schwab. This book was fantastic. In Red London, Kell and Rhy are struggling with their new connection and Kell has been put on a short leash by the King and Queen. Unsurprising, he is not happy. Meanwhile, we find out Delilah Bard is working on a ship for Alucard, who may or may not be a pirate. Everyone is reunited in Red London eventually, where an Olympic type competition for magicians is happening. The competition didn't end like I was expecting, so that was good.. Two characters really shined in this book for me were Lila and Alucard. Lila is definitely not everyone's cup of tea (and thankfully there are different narrators because a book of all Lila would be a little much). She's obnoxious and she doesn't listen to anyone. But she's also a very strong female character who I was routing for. And I LOVED Alucard. He's mysterious and I love his friendship with Lila.